Email marketing is one of the most important aspects for any startup company. It will help them build and retain their customer base, which includes their customer email list. Having such marketing, it will also help them connect and engage with their customers and eventually grow their company. While it seems like an overdone marketing strategy, email remains one of the most effective tools when it comes to customer engagement and building customer lists. In fact, many businesses still rely on an email campaigns to promote their business and ultimately increase the number of their loyal customer. Having said that, it is also important to choose the right email marketing service to help you manage your email subscriber list. Not only that, it should also allow you to create a highly engaging email and lets you manage your subscribers and contacts more effectively. There may be tons of email marketing tools out there, but if you are not careful enough, you might end up paying a lot more money for limited features and terrible functionality, which will cause you to lose even more money and subscribers as well. Fortunately, you have come to the right place. In this post, we listed 10 email marketing service providers that are sure to give you quality service for a reasonable price (some of them are very affordable). So, take a look at each tool and see how it differs from others. iContact is an excellent email marketing service provider that enables you to easily create and track email campaigns. It incorporates complete surveys, auto-responders, Salesforce integration, marketing automation, and so much more. It keeps your email visible in countless email inboxes. This email marketing service provider also focuses on social media platforms—it allows you to add Facebook, Twitter, LinkedIn, and Google+ buttons to every new bulk email marketing plan you send out. This will allow your customers the option to share your coupons and updates from your company. iContact also has the capability of creating, sending, and managing custom surveys, which allows you to get important feedback from your customers, and encourages two-way communication. In addition, iContact also lets you create a customized email that suits your website. You can insert images, add hyperlinks, tables, lines, and other basic formatting features. MailChimp is your best bet if you are looking for an email marketing service provider that is both affordable and extremely easy to use. It is also one of the most popular email marketing service provider, so it is easy for you to find help if you ever get stuck on a slightly complicated process. It has a very easy-to use interface and packed with tons of great tools and amazing support. It comes with easy email creator, merge tags, autoresponders, segmenting contacts into groups, and a simple tracking and analytics. You can also schedule or set up delivery time depending on the recipient’s time zone and set up segmenting based on geolocation. MailChimp integrates with WordPress, Magneto, Shopify, and many other platforms. Their paid plan starts at $10/month. But, they have forever free plan which allows you to send 12,000 emails for up to 2,000 subscribers. Ideal for non-profit start-ups. The only downside of this email marketing service provider is that they force users to double opt-in to join your list, one on your website and then again, by confirming their email. While it reduces your email bounces, it affects the size of your email list. Apart from MailChimp, AWeber is also one of the most popular email marketing service provider in the world. It is cost-effective and very easy to use. It has all the important features needed for an effective email marketing, without being feature heavy. Getting started with AWeber is very easy, it has a reporting that allows you to learn what does and what does not work, and their email campaign creator is very helpful in walking you through on setting up your signup forms and newsletters. In addition, their support features include live chat, phone support, email support, live webinars, and a lot of how-tos and tutorials. AWeber incorporates split testing that enables you to send different variations of a campaign to different segments of your list, allowing you to compare and improve your open and engagement rates. It integrates seamlessly with WordPress, which lets you add email signup forms to your WP website in just a single click. They also offer auto responders, RSS-to-email, email tracking with detailed insights, email list management, and a ton of third-party integrations. Constant Contact is one of the largest and fastest growing email marketing service provider in the world and one of the best email marketing solutions. It is also considered to be the easiest to use and a beginner-friendly email marketing service, as it allows you to easily create email campaigns, manage your email list, contacts, email templates and more. Constant Contact gives you full access to tracking and reporting, allows you to manage built-in social media sharing tools, provides you with an image library and 1GB of storage for your own files and important documents, and offers an unmatched support with live chat, email, community support, and a vast library of helpful resources. They also offer a personal marketing coach that will assist you regarding with any of your questions or problems. And they also created a one-stop shop for marketers, with event registration tool, feedback forms, and surveys. GetResponse is also one of the best choices for an email marketing service provider. It is very easy to use, simplifies email marketing for anyone, regardless of their level of technical expertise, and it only takes seconds for you to import your email list. They have some impressive marketing automation tools, that allows you to create smart automated campaigns. They also have 500+ beautifully designed email templates—all works well for mobile devices, that allows beginners to easily create professional looking newsletters and autoresponders. They also have a drag and drop builder, so you can easily create campaigns, segment contacts, and send content designed for specific groups. GetResponse also comes with responsive forms, landing pages, A/B testing, split testing, and tracking. Plus, they also have many impressive integrations with services like WordPress, Salesforce, PayPal, Zendesk, and Shopify. While their form builder does the job, many people find themselves spending longer time customizing forms with their less intuitive form builder and their marketing automation rules are quite limited, so it is really a matter of preferences. ConvertKit is one of the recently launched email marketing service provider, but lately, they have been getting awesome reviews from the blogging community, such as a robust email marketing platform for professional bloggers, authors, and marketers, very easy to use, and incredibly powerful tool. ConverKit includes a wide range of unique tools for startup blogger to make it easy for them to build their list and promote their content. You can also easily segment contacts from those who are interested and those who have already purchased. It also comes with easy to manage auto-responders. With “if this happens… do that” style automation builder, it makes it easy for anyone to set up a range of segmented drip email campaigns. In addition, ConvertKit also has a dedicated section for building email campaigns around web courses. The only disadvantage we find on this email marketing service is that it is on the higher end of the price range and it does not have a free trial (that’s a bummer). Aside from that, there are no other downsides to point out about this tool. Campaign Monitor is also one of the most popular email marketing solutions. It does the job done right and gives you everything you need to run a successful email campaign. With their easy to use drag and drop email builder, you can create professional email campaign in no time. Their drag and drop segmented tool allow you to create different email campaigns for different contacts and you can categorize it based on their behavior and actions. They also have pre-designed email templates that you can use and make it your own so you can quickly create an email with beautiful design. Using their rich customer data, you can personalize each message to tailor it to the recipient and to make your email more professional and gives better results. Campaign Monitor also has A/B testing, tracking, optimization, and social sharing tools. Their customer support is available 24/7 via email and support forums. On the other hand, it still lacks third-party integration, can not import Gmail or third-party address books, and no image library. Active Campaign is one of the most feature-packed email marketing automation and email marketing service provider for small to medium-sized businesses, including startups. It is very easy to use and one of the most affordable tools, starting from $9 per month and a 14-day trial. Active Campaign combines email marketing and marketing automation with CRM for managing leads and for nurturing your leads into customers. Basically, it is considered as an all-in-one platform for handling and managing business sales and marketing. 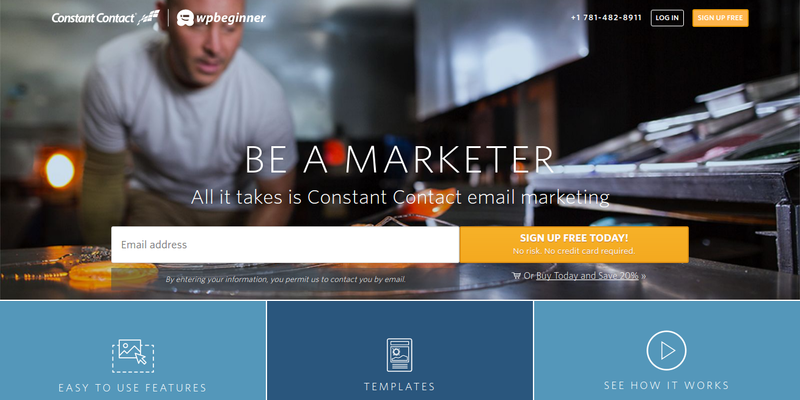 This email marketing service provider comes with email template editor and mobile friendly signup forms, allowing you to segment contacts based on the demographics, actions, location, behavior, and social data. On top of this, you can obtain additional data about your contacts using only their email address. Only thing Active Campaign needs to improve is their reporting. Although it contains all the insights you expected to see, it is not that easy to interpret all the status. So, it is not ideal for people who are just starting out with email marketing and relies on reports to better understand the outcomes. 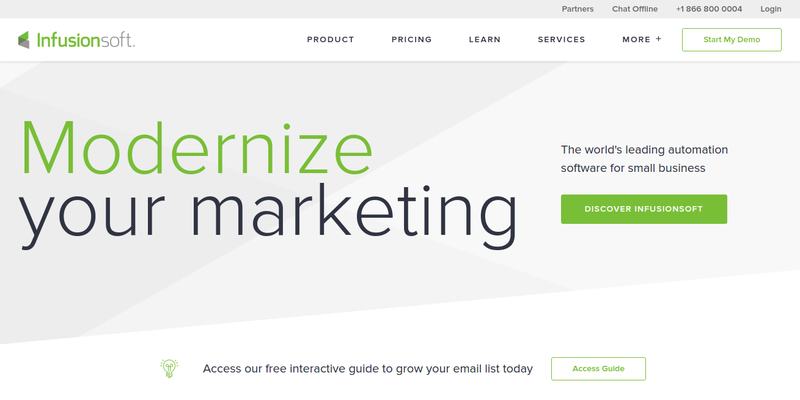 Infusionsoft is a full CRM system, with marketing automation and e-commerce tools, allowing you to automate your sales and email marketing based on your customer’s behavior, action, location, and other things. The best thing about Infusionsoft is that it allows you to send emails to your contacts with a different message depending on what each of your contacts has or hasn’t done or depending on your contact’s details. For example, you can automatically send discount coupons to your contacts on their birthday. Or you can create a funnel that turns your non-paying subscribers into customers. All of that is possible with Infusionsoft. However, Infusionsoft is a complex tool and it is not ideal for those who are just starting out with email marketing. Plus, it is expensive. Their pricing starts at $199 per month. But, it is worth the money if you are looking for an effective email marketing automation that can generate much profit for your startup business. SendinBlue is a transactional email service provider and also a good email marketing service provider. They are not a very well known email marketing solution but they sure does have a strong reputation for being one of the most reliable transactional email services, which is also an excellent tool to consider. Not only does SendinBlue offers transactional email and email marketing services, but they also have options for SMS campaign. They also have some promising features, such as easy password reset, fast order confirmation, account creations, and tons of responsive design email templates that you can easily use to set up your email campaign faster. Tracking your email campaign also made a lot easier, you can track your email campaign reports easily on the statistics tab of your SendinBlue dashboard and view more details on the “My Campaign” tab. Their marketing automation tool is also very easy to use and they have plugins with e-commerce platform for Shopify and Magento, so you’ll be able to perform basic website and product purchase monitoring. Their paid plans begin at $7.37 per month but SendInBlue also offers a feature-limited free plan. If you are looking for a tool that combines transactional email with email marketing, this tool is worth considering.